Westworld, HBO's science fiction series based on the 1973 Michael Crichton (Jurassic Park) film of the same name, has taken viewers into a world where anything you desire can be yours. If you haven't had a chance to catch Season One, now's your chance. 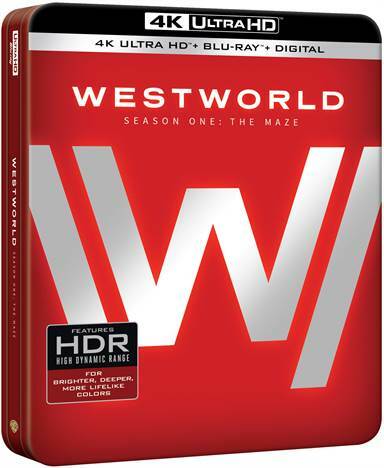 Available on 4K Ultra HD Blu-ray, Westworld promises a ride you will never forget. Westworld is run by Dr. Robert Ford (Anthony Hopkins; Thor: Ragnarok), who, along with partner Bernard Lowe (Jeffrey Wright; The Hunger Games) have created a theme park where you can have your every wish and desire come to life and live out your fantasies in the days of the Old West. The lifelike animatronics are there to cater to your needs, and there are no limits to what you can do. However, at some point, even those with artificial intelligence begin to see that they aren't treated fairly and, as we know from other tales of AI rising up, sometimes the things we create for our convenience/pleasure can turn out to be our downfall. The world of Westworld is populated by an array of very complex characters including a frontier woman Dolores Abernathy (Evan Rachel Wood; Once and Again), a ruthless man in black (Ed Harris; Run All Night), a madame that is more than meets the eye (Thandie Newton; Mission Impossible 2), and a "new to town" settler (James Marsden; X-men). With the reimagining of this property, producers Jonathan Nolan and Lisa Joy have tried to answer the age-old question, "What makes us human?". They have wrapped this high power concept into a show fraught with corporate greed/espionage, rogue robots and corrupt humans that all takes place in a futuristic world which contains what amounts to a sick/twisted adult Disney Frontierland-like theme park. To coin a phrase from another high profile, Michael Crichton property, Westworld and its creator's "spared no expense" when recreating this property for the small screen. Shot on 35mm film, Westworld offers sets that you would normally see on a large scale Hollywood film. The frontier sets look like they are real and not just built quickly for a television production, while the interior hallways of the corporation follow the same architecture that one might find at a high-end Apple store. The score, produced by Ramin Djawadi (Game of Thrones), is hauntingly eerie and at the same time energetic at just the right moments creating a sense of unease while watching the series. But the real arenas where Westworld is at the top of their game is their cast and the script. With the combination of Jonathan Nolan, Hopkins, Harris, Wood, and Marsden, one would hope you would get a superbly acting and scripted show, but the truth is even better than that. With the combination of the amazing script by Nolan and the actors, you get probably one of the best-scripted shows to ever be put on television. The story is smart and evenly paced, while the actors truly make you believe you are a visitor to this amazing world. 4K UHD film releases are now pretty much the norm when a film is coming to the home entertainment market these days. However, Westworld Season 1 is the first time ever a tv show has been released on this new high definition platform, and Warner Bros even went the extra mile and added Dolby Vision to its remastering of the series. To put it mildly, the show looks amazing. The 2160p 1.78:1 aspect ratio of Westworld is a truly demo worth picture. The Westworld park literally jumps off the television and you feel like you are truly immersed in the show. Details are sharp and crisp, while blacks are spot on, and the HDR color spectrum with the combination of Dolby Vision is so lifelike you really feel like your television is a window to another world. The first season of Westworld already had a top-notch DTS-HD MA 5.1 soundtrack that I dare say sounded better than most films these days, but the addition of the Dolby Atmos soundtrack puts Westworld's audio presentation on another level. The addition of the height tracks provides great spacial depth to the presentation, making you feel like you are actually in a saloon or on the frontier. About the Series - Producers and cast contemplate the ultimate question - "What if Westworld really existed?" An Invitation to the Set - Executive Producers J.J. Abrams, Jonathan Nolan, and Lisa Joy along with actors Jeffrey Wright and Evan Rachel Wood discuss the appeal of Westworld, what it means to "Live Without Limits", and the questions that the series asks of the audience. The Big Moment - A look at key scenes from episodes of the show. Welcome to Westworld - Executive Producers J.J. Abrams, Jonathan Nolan, and Lisa Joy along with actors Thandie Newton, James Marsden and Evan Rachel Wood consider what a world of immersive fantasy means in terms of reality, humanity, and technology. Realize the Dream: The First Week on the Set of Westworld - An eleven-minute look behind the scenes of this unique show. Imagining the Main Title - A look behind the scenes into the opening title sequence of the show. Reality of A.I. : Westworld - Executive Producers J.J. Abrams, Jonathan Nolan, and Lisa Joy along with actors Thandie Newton and Evan Rachel Wood discuss the complicated nature of AI and the existential threats it poses to the Westworld. The Big Moment - Another look at key scenes from episodes of the show. Gag Reel — A quick outtake reel from the filming of Season 1. The Big Moment - A final look at key scenes from episodes of the show. The Key to the Chords - A Look into the shows music by Ramin Djawadi as well as the piano that plays such a big part in the show. Crafting the Narrative - Executive Producers Jonathan Nolan and Lisa Joy watch the final episode of Westworld and provide commentary on integral scenes; discussing the roles of memory, inner-monologues, mythology, along with the cast and crew that brought the episode to life. With Westworld, Jonathan Nolan and Lisa Joy have created one of the greatest cinematic pieces to ever grace the television screen, providing more questions than answers about the age-old concept of being alive. One can only hope that Season 2 is up to the same pedigree when it comes out in 2018. Download Westworld: The Complete First Season from the iTunes Store in Digial HD.